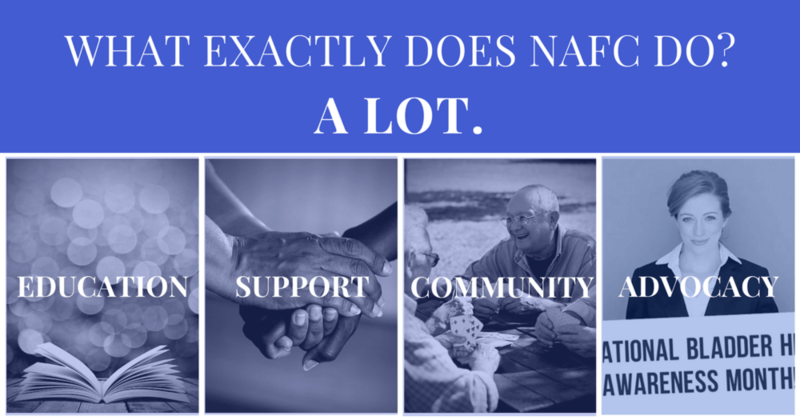 What Exactly Does NAFC Do?....A Lot. As a visitor to this blog and website, you probably know that NAFC exists to help those with incontinence. In fact, our mission is pretty clear: The National Association For Continence is a national non-profit organization dedicated to improving the quality of life of people with incontinence, voiding dysfunction, and related pelvic floor disorders. Our purpose is to be the leading source for public education and advocacy about the causes, prevention, diagnosis, treatments, and management alternatives for incontinence. Simply put, we don’t think anyone should have to live with bladder leaks. NAFC strives to de-stigmatize incontinence, promote preventative measures, and motivate individuals to seek treatment. We’re providing high-quality information that you can trust. NAFC creates and publishes (with the help of qualified healthcare professionals) information about all types of bladder and bowel health conditions and makes it all available through our website, NAFC.org, for anyone and everyone to learn from. We offer free brochures, tools to help you manage your condition, regularly updated stories and blogs from patients living with incontinence and experts on the condition, and even a way to find a doctor near you. We offer Healthcare Professionals tools for their office, free courses they can use in their community to educate patients, and up to date information about incontinence and the incontinence market. Above all else, we want people to be educated about their condition and to know the options available to them. Our high quality content means nothing if we’re not able to get it to the people who need us. We are a small organization, with even smaller budgets. But despite that, we’ve managed to reach quite a large number of people with our message. In the past 12 months, we’ve had nearly 1 million people visit our website. Our efforts in social media and online advertising have had over 10 million impressions. On a monthly basis we send our newsletter, filled with tips, management tools, and news on incontinence to over 10,000 people. And our awareness campaign this past year has helped show millions that a “Life Without Leaks” is a very real possibility. NAFC’s message boards are filled with nearly 2,000 active users and were visited 30,000 times in the past year. Our message boards have become a safe haven for those looking for advice from others going through similar things, or for those who just need to talk to someone who understands. Our goal when creating the message boards was to build an open, safe place where people can speak freely about their condition with no judgment. And judging by the number of people participating, we think we’ve done that. NAFC also maintains an active social media presence on Facebook and Twitter to help foster community and interact with those looking for information on incontinence. We’re advocates for quality standards. Did you know that not all absorbent products are created equally? NAFC has long been an advocate for quality standards across adult absorbent products to ensure products are made with safe materials, are created with multiple sizing options and absorbency levels in mind, and are effective in keeping moisture away from the skin to prevent irritation. We’ve published standards for disposable absorbent products and have created a Task Force that had been working to make it easier for states to adopt these standards. Learn more about our efforts here. NAFC works tirelessly everyday to bring you quality information and to provide a community where you can learn and connect with others. And we’re fighting every day to ensure you have quality products to help you manage your condition. But we need your help to continue. All of our hard work also comes with expenses: website and server upkeep and maintenance, the development of new educational content, tools and programs, and the staff to support all of our advocacy and awareness efforts. Will you help us this season by making a donation to NAFC? Our continued success depends on you. And with over 25 million people in the US living with incontinence, we still have a long way to go. If NAFC has made even a small difference in your life, please consider making a tax-deductible donation today. We’re proud to serve you and to be bringing awareness to this condition that so often causes shame, embarrassment, and a reduced quality of life. Help us continue by making a donation today! Give To NAFC With AmazonSmile! Want To Make A Difference For NAFC This Holiday Season? Here's How To Give Back. Giving Tuesday Is November 27th, 2018! Make NAFC A Part Of Your Giving Plans!